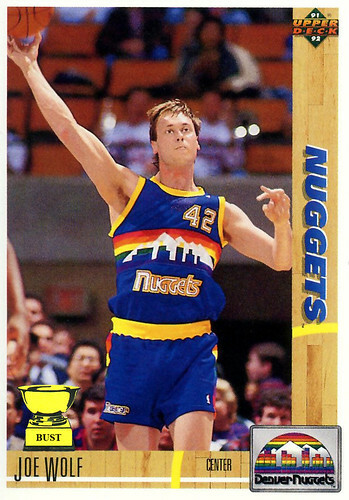 Stiff as a board: How bad were the 1991-92 Nuggets? That April, as the season ground to an excruciating halt, the team pulled out all the stops to keep fans interested. Late in a game against the Dallas Mavericks, coach Paul Westhead substituted in a 7-foot-tall mannequin named "Joe Wolf." During timeouts, Wolf was posed in different ways under the opponent's basket — in the shot above, he is seen looking like a quarterback throwing a pass. While Wolf obviously didn't score any points, he did lead the team in blocked shots that night, thus earning his very own basketball card. He now "works" at Jumbo Joe's Big & Tall in Fort Collins, Colo., wearing the same cheesy uniform seen here.